After acquiring the NASCAR license from Eutechnyx, publisher Dusenberry Martin Racing (DMR) has announced the return of developer Monster Games to develop NASCAR Heat Evolution for PS4 & XB1. The Northfield, Minnesota-based studio previously developed NASCAR Heat and NASCAR Dirt to Daytona in the early 2000s. While no game media happened to be released with the news, it was disclosed that the game will include all 23 licensed NASCAR tracks, a new AI and Speed Rating system, Career and Chase modes, as well as the return of Challenges. UPDATE - The first game trailer is expected to coincide with the Coca-Cola 400 in early July. 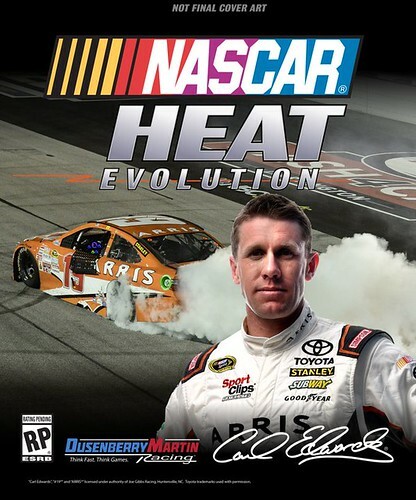 Carl Edwards will grace the cover of the game when it releases on September 13, 2016. Continue on to read the first game details straight from DMR. NASCAR Heat Evolution will race its way to Xbox One, PlayStation 4, and PC on September 13, 2016. For the first time on Xbox One and PlayStation 4, race as your favorite NASCAR Sprint Cup Series drivers across all 23 licensed NASCAR tracks in stunning HD. Get ready for the most fun you’ve had with a NASCAR game in years! Whether you’re a casual racer or die-hard sim fan, NASCAR Heat Evolution will adjust to your skill level with a brand new AI and Speed Rating system that applies the right amount of challenge for you. In addition to pick-up-and-place races and Career Mode, the all-new Chase mode allows you to experience the excitement of the final 10 races of the NASCAR season as you compete to take home the prestigious Sprint Cup. You asked for them and we listened… Challenges are back! Relive or rewrite this season’s most memorable moments as the drivers who lived them. After over a decade, Monster Games returns to NASCAR. This team of all-stars created the original NASCAR Heat and NASCAR: Dirt to Daytona, two of the most highly rated and best-selling NASCAR titles of all-time. This dedicated group has built NASCAR Heat Evolution from the ground up to ensure a brand new racing experience. Sweet! Hopefully this lives up to the hype. I've been waiting years for a truly good, solid NASCAR game. I don't care about racing games and certainly don't have any interest in NASCAR. However if I did, the "Everyone wants to win" paragraph would concern me very much. That sounds like rubber band AI. Definitely not something that belongs in sports games. All times are GMT -5. The time now is 05:40 AM.